Welcoming a new kitty to the family? Lucky you! Don't furget cats are climbers and love to play with scratching toys! Cat owners will love our purrfect one-of-a-kind starter kit. 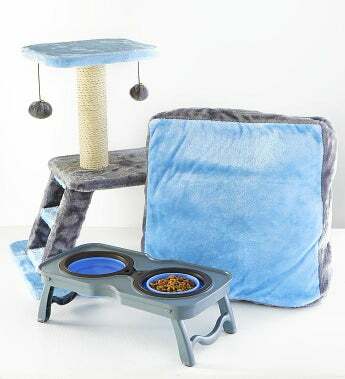 This fabulous gift includes a fleece cat tree, incredibly soft fleece bed, collapsible water & food bowl, a sisal scratching post, hanging toys & more! It's the cat's pajamas!